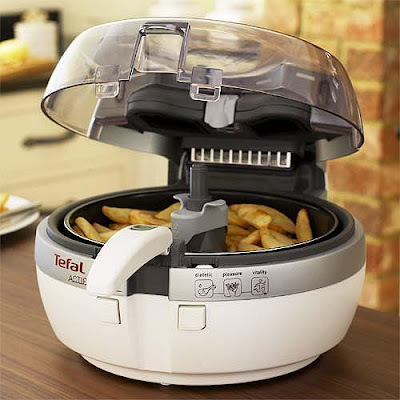 Many months ago I wished I had my hands on T-Fal's Actifry deep fryer which promoted itself as being capable of "frying" 2.2lbs of French fries using a single tablespoon of oil. Happily my generous parents answered my wish and bought me one for my birthday. So, was it everything I'd hoped for? There's zero doubt that it makes far, far tastier French fries than our homemade oven baked versions or storebought oven baked. The fries are very crispy on the outside and soft like a fry should be on the inside, but they're not quite deep fried. We've been using the Actifry more lately to make sweet potato fries as sweet potatoes are far healthier choices than regular potatoes. Given the machine's design, it's not going to replace a person's deep fryer for many items other than French and stir fries, but my biggest beef with the Actifry? Cost. The thing's stupidly expensive. $299 for a heated, teflon-coated ceramic pan with a rotating arm? That price puts this item in the realm of gift only where the best gifts are those things you want but could never in a million years justify buying for yourself.